Thiruvananthapuram : The Indian Navy and Coast Guard rescued 33 fishermen from the deep sea in the wake of cyclonic storm Ockhi that hit the southern districts of Kerala and Tamil Nadu, Chief Minister Pinarayi Vijayan said on Friday. Vijayan, who held a high-level meeting, said there was no reason to panic as matters were under control with efforts of the Navy and Coast Guard. He also said they would ask the Defence Ministry for more naval aircraft to help rescue stranded fishermen. Meanwhile, angry groups of fishermen in the coastal villages in Poovar, Vizhinjam and Kovalam have threatened to block the highways if the rescue operations are not intensified. Addressing reporters here, Vijayan said: "Seven ships and four helicopters have been deployed and the Director General of shipping has also given directions to passing merchant ships to extend all help to fishermen caught in the sea. Two such ships rescued 10 fishermen. The biggest problem the rescue team is facing is that fishermen in the deep sea are not willing to let go their boats, which is creating a problem," said Vijayan. "We have decided to ask the Union Defence Ministry to send more aircraft, as according to meteorological reports, Lakshadweep and Kerala are going to face the sea's wrath and hence more aircraft are needed," said Vijayan, adding that fishermen in the deep sea have been given food packets. Quoting meteorological reports, he said that it was a major relief that the cyclonic winds that were 70 km from the Kerala coastline on Thursday, are now around 200 km from the coast. The meteorological office has predicted that rains will continue in Kerala for a day or two more and in Lakshadweep. "The situation is such that in the deep sea, during these periods of bad weather, it's not feasible to use helicopters for rescue operations," said Sudevan, the IMD director here. 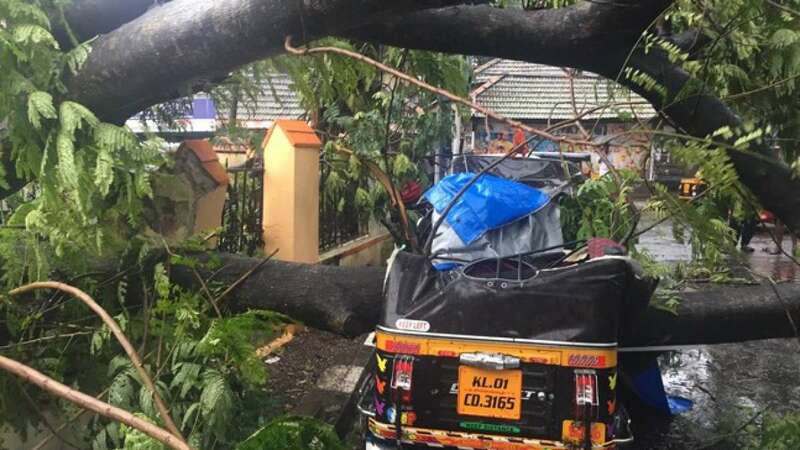 Several persons were killed on Thursday after cyclonic storm Ockhi hit the southern districts of Kerala and Tamil Nadu due to a depression formed over southwest Bay of Bengal near the Sri Lankan coast. It has moved westwards and intensified into a deep depression.Kerala Fisheries Minister J. Mercykutty told IANS that she has held a meeting with Vijayan. "It's wrong to say that fishermen are missing. The rescue teams have already saved 33, while 70 of them who are caught in the deep sea have started to respond to the messages sent to them," said Mercykutty. The meteorological office has predicted heavy to very heavy rain at isolated places over south Tamil Nadu and south Kerala. "The state government acted in quick time when we heard about the bad weather conditions. An emergency meeting was called by the Chief Minister and a control room set up. We got in touch with the Navy and the Coast Guard, who immediately got going," said the Minister. "At some places, though, the sea is very rough and even the rescue team is unable to reach," added the Minister. Muthappan, a fisherman from near the Thiruvananthapuram airport who was rescued, told the media that he and four others were in a boat at around 2 p.m. on Thursday, when things started turning dangerous in the deep sea. "We were thrown out of the boat and while four of us held on to the boat that had overturned, another person was holding on to a kerosene barrel. "It was only after three hours that we were rescued by another boat," said Muthappan, who was admitted to the General hospital here. Vincent, another rescued fisherman, said they had left the seashore here around 10 a.m. on Thursday. "We had travelled around 10 nautical miles into the sea, when things started going bad. "It was a nightmare as massive waves were smashing all around and the boat that we were on, after holding on for an hour, lost balance and overturned. "While five of us after an hour were rescued, we have no idea of what happened to the two others who were with us," said Vincent, who was spotted at the Vizhinjam beach, here.